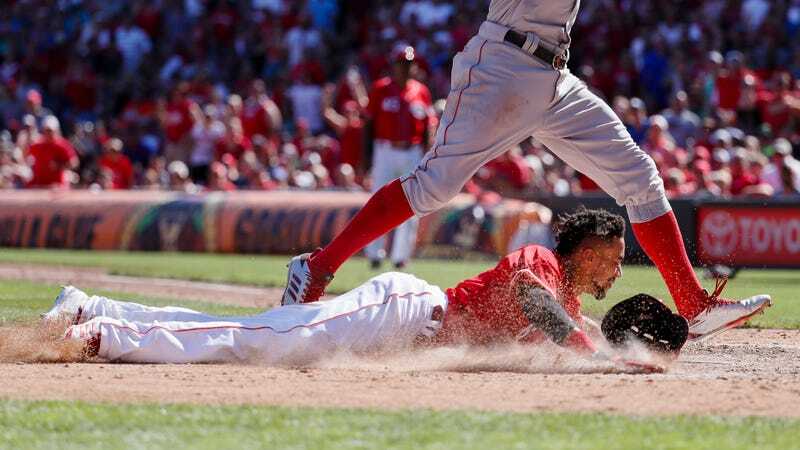 Billy Hamilton, who leads MLB in stolen bases, was a little too eager to get another one Sunday against the Red Sox, as the Reds’ center fielder found himself in a pickle after he jumped on a pickoff throw. Dustin Pedroia’s error, however, not only bailed Hamilton out, but allowed him to get all the way home. Officially, that’s a caught stealing and an error, so Hamilton didn’t add to his total of 58. Really though, Billy Hamilton at top speed is so impressive that he should get credit for all three bases.